Sometime last year, I (Lynne) found some fabulous knit fabric at the ARC Thrift Store in Louisville, Colorado. There were actually two pieces, each costing $3 or less. One I kept and one I gave to Kitty, in a challenge to see what each of us would make. At long last, we are ready to reveal our masterpieces! Lynne’s Top: I (Lynne) actually made my top during the colder months. The fabric is nice and soft and not too lightweight. 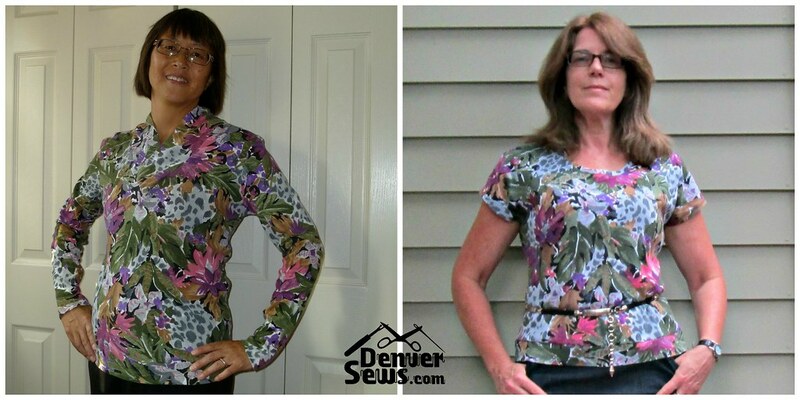 It seemed perfect for a warm top like Kwik Sew 3915, Ruched Neck Tops. I’ve made both views before and even reviewed the pattern here. But my preference is for the V-neck. I’ve worn this top many times (without telling Kitty) and really enjoy it in cold weather. Kitty’s Top: I (Kitty) made my top in July, due to the fact that I need to “season” my fabrics before using them. (Procrastination is my true art form). So my top is a warm weather top, from a free downloadable Cake pattern, the Tee. (To download click on Tee and then click on the download link you’ll find in the sidebar on the right at Cake). This is a simple Tee pattern but I managed to mess it up. There’s a cute micro-pocket but I sewed it on totally crooked. Luckily the pocket blends into the fabric print. I also cut the top too long and sewed the hem band on upside down. Unfortunately this is pretty typical sewing for me! On the plus side this fabric was a dream to sew with. As Lynne said, it’s a great weight, and super soft. And the cut edges don’t curl up which I always appreciate in knits. Thanks Lynne, for this lovely fabric! Stay Tuned! We did a second swap with an interesting woven fabric in green and brown that Kitty found at Mile High Thrift in Northglenn, Colorado. We’ll reveal our 2nd fabric swap creations in a future post. 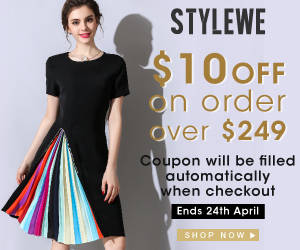 I love the idea of sharing fabric finds. Kitty’s comments on her sewing goofs made me giggle. Sometimes I forget to laugh at myself for this same stuff. Love the two of you sewing from the same fabric!! !